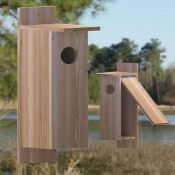 Nestboxes play a key role in helping native cavity-nesters overcome a continuing loss of natural cavities. 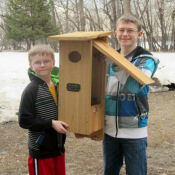 By placing a nestbox in your yard or habitat, you can become part of this rewarding conservation effort. 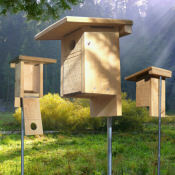 To learn more about hosting native cavity-nesters, our tutorials will help you get started, from selecting your first nestbox to properly mounting it. 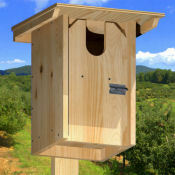 Building your own nestbox, while a fascinating hobby in itself, is not required. 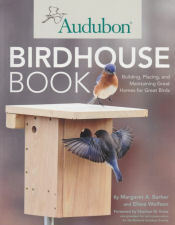 But if you do decide to try your hand at building, we've included six tutorials, plus free, downloadable plans with descriptions and color photos of over 25 nestboxes. 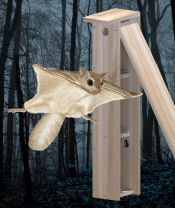 A new method of hinging nestbox doors saves time and material. 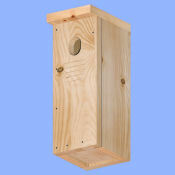 A nestbox specifically designed for the American Kestrel. 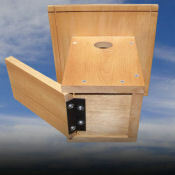 Easy to build trail box designed by leading Bluebirders. 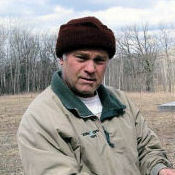 Steve discusses how the Gilwood nestbox evolved, and shares some secrets as to why this box has become a Bluebird magnet. 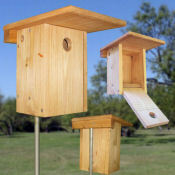 The Classic 22 is available in both front opening and side opening versions.